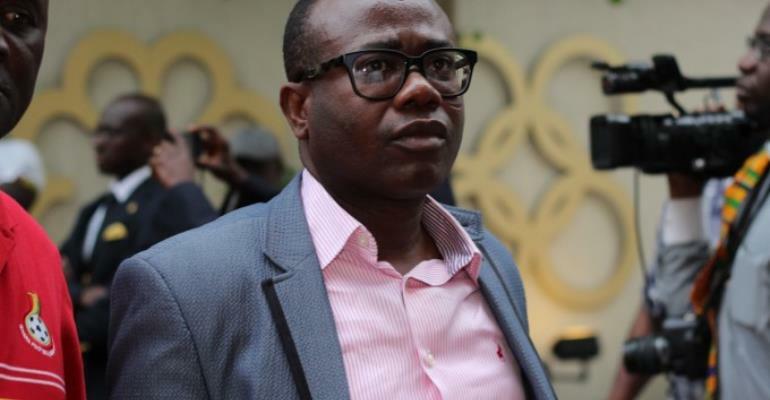 President of the Ghana Football Association (GFA), Kwasi Nyantakyi, yesterday landed in the hands of personnel of the Criminal Investigation Department (CID) of the Ghana Police Service at the Kotoka International Airport minutes after his arrival from Morocco on board Ethiopian Airline. He was picked up about mid-morning by three officers from the CID and immediately whisked him to the CID headquarters to help the police to investigate an official complaint against him lodged by President Akufo-Addo. The GFA boss was said to have expressed his willingness to assist the police investigators after going through about five hours of grilling. Mr. Nyantakyi has been captured in a new investigative piece by ace journalist, Anas Aremeyaw Anas, and his Tiger Eye PI team, for allegedly using the names of President Akufo-Addo, Vice President Dr Mahamudu Bawumia and other top government officials to demand bribe from some supposed foreign investors. He was captured on the tape bragging to the Arabian investors that he has the president in his pocket and that he could help them to get to him (president) without much hassle. The GFA president, who was in a blue suit with a white shirt under the coat, landed at the CID headquarters at about 11 am yesterday together with some officials of the association and his lawyers. He was then taken to the third floor of the building, where he was made to sit at the conference room to wait for interrogators. The police later accompanied him to his residence for a search. There was a horde of journalists holding their gadgets and taking positions to catch a clear view of what was happening. As of 8 am yesterday, reporters – mostly on sports beats – had gathered on the premises of the CID headquarters trying to catch a glimpse of the FA boss; but by the time he was ushered into the building, the police had cordoned off the area and so he could not be captured on cameras by the eagle-eyed ‘paparazzi’. A source at the CID headquarters indicated that after the grilling, Mr Nyantakyi was granted bail. However, the bail conditions were not made known. The GFA president was said to have cut short his official trip to Morocco on the ticket of the Confederation of African Football (CAF) after the complaint had been lodged at the CID head office. The complaint by the President of Mr. Nyantakyi’s conduct has generated media frenzy and some level of heated public debate. A Deputy Chief of Staff, Samuel Abu Jinapor, said at a media briefing on Tuesday that the GFA boss was the subject of an investigation by the CID after the President had seen parts of an investigative piece by Anas Aremeyaw Anas. Mr. Jinapor said Mr. Nyantakyi was captured allegedly trying to secure investments in the name of the President, Vice President and other key government officials, and that formed the basis for President Akufo-Addo’s complaint to the police CID. The police then gave the assurance that “due process would be followed in the investigation,” and called on person(s) with relevant information to submit it to the CID headquarters. Anas and his team’s documentary is expected to be premiered on June 6, 2018, at the Accra International Conference Centre. Abdul Malik Kweku Baako Jnr., editor-in-chief of The New Crusading Guide newspaper, said later that the announcement from the Jubilee House that the CID was going after the GFA boss was hastily done and revealed that there was a confidential agreement between Anas’s Tiger Eye PI and the BBC on one hand and the Presidency on the other over the handling of the issue; but it appeared to have been breached. Mr. Baako said on Peace FM yesterday that there was a confidentiality agreement banning the revelation of the content on the tape- at least until the day before the full video is due for premiering (on June 6, 2018). He said the Presidency explained to him that the announcement had to be made because suggestions were being made, especially on social media, that the President and his Vice were cited for wrongdoing in the –yet-to-be-aired investigative video. The content of the video, on the FA boss reportedly watched by the President, is about five minutes and in respect of the Vice President, it is a three-minute documentary. Mr. Baako said the Nyantakyi component is only a fraction of the potential infractions and ethical violations captured by Anas and his Tiger Eye PI crew. “You will see so many things, hundreds of people involved – football administrators, political elements, referees, linesmen (assistant referees) and so on” – he hinted.